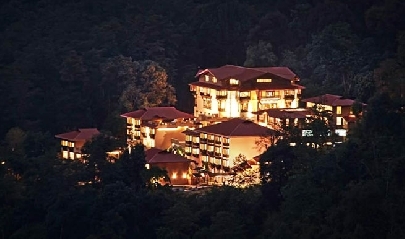 One of the best luxury hotels in Sikkim, the Chumbi Mountain Retreat Resort and Spa in Pelling is a wonderful retreat, away from the hustle-bustle of the city life. 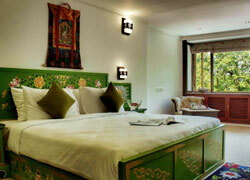 It is an ideal place to experience traditional, royal hospitality of Sikkim. A property of the Chumbi Group of Hotels owned by filmmaker and hotelier Ugyen Chopel, the resort is perfect accommodation option for family vacationers as well as business guests. The guest rooms and suites at the Chumbi Mountain Retreat Resort and Spa, Sikkim, are a wonderful combination of traditional Sikkimese ambiance, contemporary comforts, a 5-star feel, and superb views of Mt. Khangchendzonga. 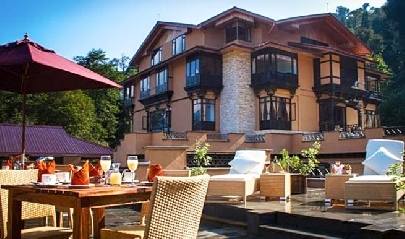 The various fine dining venues at the hotel in Sikkim serve lip-smacking dishes of authentic Sikkimese, Indian and Continental cuisines, along with fine beverages. Menlha – Dottho and Spa, LIDO – Movie Theatre, White Hall- Conference Hall, Fire pit- area for bonfire under the sky and Amphitheatre for various events are some of the facilities offered here. As the natural light enters the room, it whole ambiance becomes meditative. 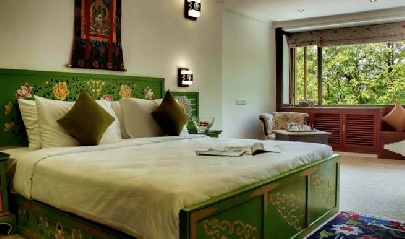 Giving out the feel of Thrasha, the hermitage quarters of the Buddhist monks, every room has antique wooden floor, an austere elegance and minimal interior décor along with all the contemporary comforts such as work desk, LCD TV wtc. All the 4 Hermitage Blocks have a sun deck from where the guests can relish stunning views of the snow-clad Khangchendzonga peak. 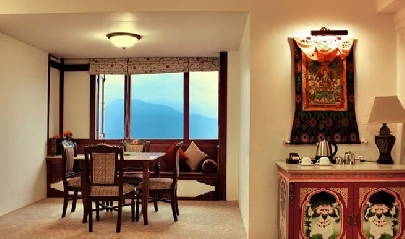 Feel like Sikkimese royalty during your stay in the Yuksom suite that offers a blend of traditional heritage appeal and modern amenities. Yuksom was the place where the first king of Sikkim was crowned by 3 lamas. From the windows, the guests can savor lovely views of the Bayul Demajong valley. 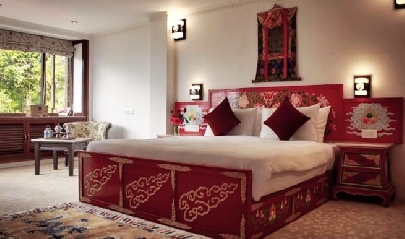 Combination of 5-star luxury such as separate living room and bedroom, a grand royal feel and traditional crafts made by the local artisans, makes your stay memorable. The attached bathrooms have all the modern amenities and fittings. Clubbing traditional heritage of Sikkim with world-class comforts, the Rabdentse suite is an ideal option to enjoy a treatment like royalty. Located just a few kilometers from the Chumbi Mountain Retreat & Spa, Rabdentse was Sikkim’s second capital that is enveloped by verdant jungles of the Sidkeong Tulku Bird Sanctuary. The attached bathrooms feature natural lighting, view of Mt. Khangchendzonga and complimentary premium toiletries. 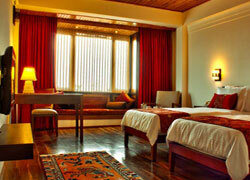 Located in the main block of the hotel, the Raj Suite is known to own an ambiance of Colonial India. 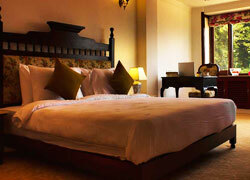 Antique furniture in the suite blends seamlessly with modern comforts, offering a comfortable stay to the guests. The Khangchendzonga looks beautiful from here. Offering the ambiance of a traditional Sikkimese living room, Dyenkhang is an ideal dining venue to enjoy local hospitality. The chefs prepare local delicacies with fresh organic ingredients brought directly from the resort’s own garden. 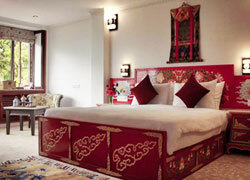 The interiors are traditional too with Choktse (Sikkimese tables) and Dyen Tshi (low seating). Offering breathtaking views of some of the world’s highest peaks, Base Camp- 17,400 feet has an amazing countryside appeal, like high-altitude trekking huts, draped in sheep-wool, typical dark woody feel and yak hair ropes. A fine assortment of photographs of popular summiteers of the world adorn the walls. Special Sikkimese ta, organic coffee from Nepal, along with other drinks are on the menu. The lovely sight of snow-capped peaks give you company. Serving delicacies of Indian and Continental cuisines, Golden Bamboo has a wonderful décor. 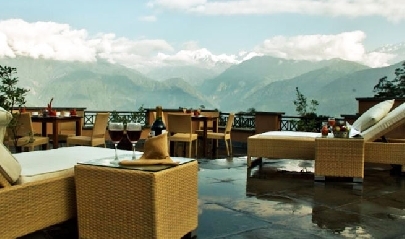 The restaurant has both indoor and outdoor dining spaces, overlooking gorges of West Sikkim.